Last week I was very excited to receive some book post! I’m not a book reviewer or book blogger so I don’t get book post as a rule. It was even more exciting because this post contained a book that we had first heard about at the inaugural Picture Book Club back in October 2016. We’ve been waiting patiently for 18 months and finally we get to see something that Sophy Henn had hinted at while we gossiped over cake. It’s no secret that I am a big Sophy Henn fan. It’s not a coincidence that she was the first Picture Book Club speaker! I dressed as Pom-Pom at my first SCBWI conference party and I was Edie last World Book Day. 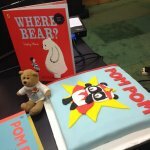 The thing that I love most about her books (apart from the lovely artwork – so amenable to dressing up or making into cake form!) is the voice. 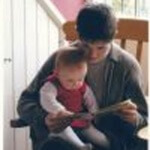 Sophy is able to get into the head of her young characters and find their voice, transferring it onto the page with what looks like consummate ease. I’m pretty sure I’m doing her a disservice and that, like most of us, she actually works really hard to get it right. But she makes it feel easy when you read it and I love that. One of the pleasures of Picture Book Club is that you sometimes get to hear publishing industry gossip after the formal talk is over. You have to be there to hear that. We don’t Facebook live the chat afterwards! Cake loosens the tongue and we’ve heard a few choice little bits of news ahead of time. My first taste of this was hearing Sophy talk about her plans for a book for slightly older readers about a Bad Nana. It sounded awesome and I’ve been waiting for it ever since! And receiving it in the post this week was such a joy, followed by the loveliness of actually getting to read it! Sophy has had some fun with the neon highlighters in the artwork. Catnip for any seven year old! But it is the voice of Jeanie (7 and 3/4) that shines out of this funny, touching book. I love a book that spans the generations. I loved all the grandmas… Shirley in Devon (sob), peach-coloured Rose but especially Bad Nana (who is awesomely bad but for all the right reasons). I laughed out loud and remembered my own childhood with my grandmas. What a fantastic book. I hope it goes on to bring Sophy continued success and I can’t wait to hear about what Bad Nana gets up to next! Thank you Sophy! You’re welcome at Picture Book Club anytime! 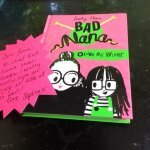 Bad Nana is published by Harper Collins on 31.5.18.